6-8 cups of water a day — YEAH RIGHT. I like to buy 1L or 1.5L bottles of vitamin water’s WATER not sugary concoctions [to keep the budget low I will refill this water bottle for a few days as I have yet to come across a 1L+ reusable water bottle]. For me I feel that when I have a large bottle of water by my side I am more inclined to keep drinking the fluid because then I know I don’t have to keep buying more water or refilling the water bottle – I’m set for a while. This being said, I ALWAYS ALWAYS ALWAYS carry a water bottle in my purse. For those of you who don’t know me personally this is why my ‘standard’ purse looks like a diaper bag; thank god oversized everything is in Vogue. I recommend drinking water throughout the day as it helps me stay alert, mentally steady, physically active and HYDRATED (a rule of thumb that I like to go by is: if my veins are not popping out of my hands then I need to refill my water bottle and start chugging). There is, however, one down side to drinking water before during and after meals/ snacks (which also will help keep you fuller longer), you always are hunting for a restroom. The drink, also known as a “master cleanse” is 10 oz water mixed with 2 tbsp lemon juice (fresh squeezed, of course), a dash of cayenne pepper and 2 tbsp maple syrup. This mixture will pull water into your colon and give it a hydrating cleanse as well as restore your body to a healthy balance of flora and remove toxins. A new creation I just discovered is 16 oz water mixed with 2 tbsp apple cider vinegar (I prefer BRAGG brand apple cider vinegar drink: flavored apple cider vinegar & sweet stevia), 2 tbsp lemon juice, 1 tsp cinnamon, dash of cayenne pepper and a few drops of liquid stevia (I prefer Trader Joe’s brand). 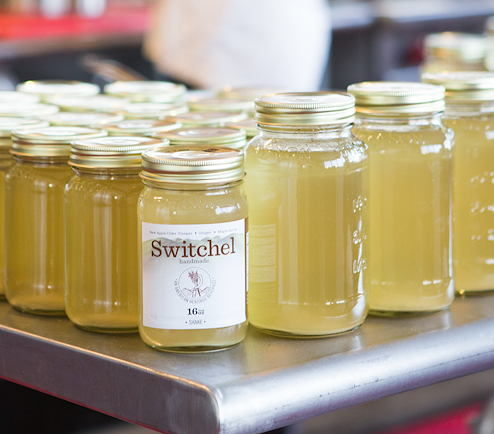 The traditional hydrator is a switchel, the one that I personally enjoy is Up Mountain Switchel which is comprised of water, apple cider vinegar, maple syrup and ginger – this company hand makes their drinks. This concoction can definitely be made at home by JUICING ginger and mixing the other ingredients! It is also a great hydrator after hot yoga or a long run on a hot summer day. If you cannot locate this brand you can try BRAGG’s apple cider vinegar drink: flavored ginger spice. WARNING: BRAGG’s drink is more sour tasting because of the strong dose of apple cider vinegar, while Up Mountain Switchel’s has more of a bite due to the extra ginger. Based on this try different types, don’t discount the health benefits because you don’t like the taste of one of them, there are different varieties or you can make your own based on your own taste preferences. 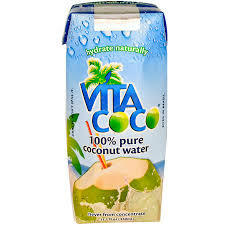 Another drink that could be used after said activities is coconut water – this item should be prepared fresh by cracking open a coconut purchase at your local grocery store. The popular brands, such as Zico, has the added ingredient carrageenan, a carcinogen – mentioned in the shake section. As I repeatedly state, it is best to go with the natural products even if it is more time consuming to prepare, over the years your body will thank you and in the mean time you will have more stamina. However, it is not always ideal to crack open a coconut, especially if your husband isn’t home to help – I can’t be trusted to have all my fingers with a knife in my hand – or when you’re walking out of an exercise class. I will provide you with a few brands that have a rich taste and fabulous nutritional benefits. 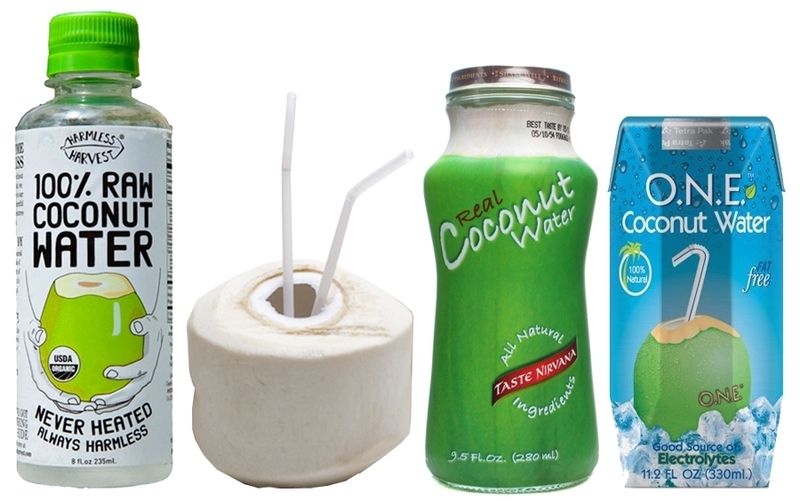 Taste Nirvana’s coconut water has little pieces of coconut floating in the water, it is a divine treat as you gulp down this electrolyte replenisher. 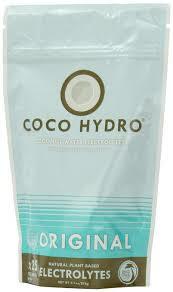 If you prefer to make your own coconut water, here is a product just for you!! I approve of this powder, it simply contains: coconut water powder, tapioca dextrose, sea salt, ionic trace minerals, ascorbic acid, citric acid and natural flavoring. The powder is a great item to bring with you to work; while consumed by a busy day running around the unit it is nice to quickly add some powder to my cup of water, guzzle it down and get back to work feeling refreshed! BLACK WATER?!?!?!!!!!! This water is chuck full of electrolytes, fulvic acid and has a pH of 8, making it an excellent hydrator that is easily absorbed by your blood stream. I highly recommend consuming one of these a day followed by one liter of water to gain the maximum hydration benefit. You could make your own by adding a drop of fulvi acid to filtered water or by purchasing these bottles made by blk. Once you try this drink you will realize how amazing it feels to be truly hydrated and feel balanced internally.